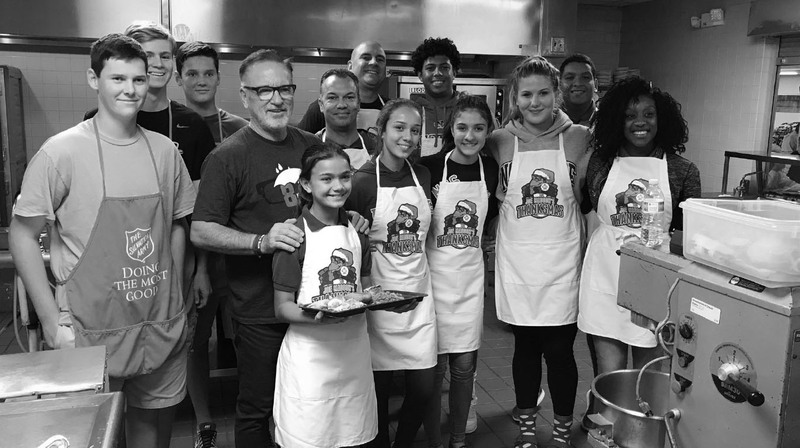 TAMPA, FL— Chicago Cubs Manager Joe Maddon’s Respect 90 Foundation will partner with Tampa-based PDQ to bring Maddon’s Thanksmas to homeless shelters in the Tampa Bay area for the tenth year, November 26-30. For the first time, PDQ will partner with Respect 90 to provide meals at the Thanksmas shelters. Respect 90 has once again partnered with CITYPAK to provide 900 custom designed, versatile, backpacks to the shelters, and Florida-based custom sock maker DivvyUp will provide 1,000 socks. As manager of the Tampa Bay Rays, Maddon hosted Thanksmas for eight years between 2006 and 2013 and provided meals, supplies and grants benefiting thousands of needy citizens from Fort Myers to Orlando. Thanksmas returned last November after a three-year hiatus. On Monday, November 26, Maddon will return to the site of his first Thanksmas in 2006, the St. Vincent de Paul Shelter in St. Petersburg. Maddon will also visit the Tampa Salvation Army on Wednesday, November 28. Thanksmas will also take place at shelters in Maddon’s hometown of Hazleton, PA in December and Chicago in January. The CITYPAK backpacks that will be distributed are manufactured by High Sierra, provider of premier, durable, outdoor gear since 1978. Backpacks will be given to the St. Petersburg Salvation Army, Trinity Café in Tampa, St. Vincent de Paul Society and Clearwater’s Homeless Empowerment Program as well as shelters in Hazleton and Chicago. “The CITYPAK Project has distributed 54,000 paks in 130 cities in North America. This could only be achieved by working with great partners like Joe Maddon’s Respect 90 Foundation,” said CITYPAK Founder Ron Kaplan. Monday, November 26, 11 a.m.
Wednesday, November 28, 4:30 p.m. Respect 90 seeks to provide children and families opportunities to develop championship attitudes through sports, academics, and community involvement in all the places the couple calls home: Chicago, IL, Tampa, FL, Mesa, AZ and Joe’s hometown of Hazleton, PA. The Respect 90 Foundation is a 501(c)(3) organization as registered with the Internal Revenue Service and gifts are tax deductible to the extent allowed by law. Founded in 2011, award-winning PDQ – short for “People Dedicated to Quality” – offers chef-driven recipes and mindful ingredients typically found in a fine casual restaurant with the value, speed and convenience of the fast food and fast casual segment. Outback Steakhouse co-founder Bob Basham and MVP Holdings CEO Nick Reader are the two principal owners of PDQ. Beloved throughout the Southeast and now beyond for its hand-breaded chicken tenders, PDQ crafts delicious salads, sandwiches and hand-spun milkshakes fresh in store, every day. PDQ is committed to creating deep roots in its local communities and has given millions in dollars and in-kind donations to local charities, schools, and organizations since its inception. On October 30, 2011, the original PDQ restaurant opened its doors in Tampa (FL) and the concept now has grown nationwide throughout Arizona, Florida, Georgia, Illinois, Nevada, New Jersey, North Carolina, Oklahoma, South Carolina, Texas and Utah. For more information, visit www.eatPDQ.com. The CITYPAK Project is a not-for-profit philanthropic organization that works to provide custom designed backpacks to homeless persons in need. Working with exclusive manufacturing partner High Sierra, The CITYPAK Project will have distributed over 42,000+ PAKs to homeless in 99+ cities by years end across North America, including Chicago, Illinois; Tampa, New York City, Boulder, Colorado; Maui, Hawaii; Austin, Texas; Boston, MA, San Francisco and Los Angeles, CA, and international distributions in Toronto and Vancouver. Founded by Chicago businessman and philanthropist Ron Kaplan in 2012, The CITYPAK Project provides a safe, convenient and versatile backpack uniquely designed to meet the constantly changing needs of the homeless.